Anyways, with Paradise tickets and seminar registrations so popular this year, it looks like a half dozen of the seminars may sell out even before September! A few more very talented artists have confirmed for the show, the magazine ads are out in Tattoo Society, Prick Magazine, and Tattoo Artist Magazine, the bi-fold cards are here and will be shipping out soon, Eternal Ink signed on as a sponsor, the "Keeping Sharp" DVD is now shipping again with a new teaser, the Retreat and 2012 Gathering posters have been commissioned, the January snowboard party is near finalized, and holy moses, the calendar is filled up with fun events! What snowboard party you may ask? Well, we're planning a day of free seminars one day, and snowboarding the next at Keystone resort in Colorado this Janurary. Details to come. I will not be boarding, I will be planning. Off the Map Tattoo has been floored by the recent wave of guest artists, Bob has been tattooing a ton of amazing color tattoos, and I'm gonna miss out on my bird tattoo this time. 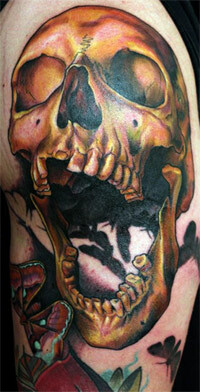 Shawn Barber, who did the skull tattoo shown, is always a strong professional inspiration. I'll be getting some fun hand tattoos from him in the future. Stefano had to leave a tad early, and packed 5 world class tattoos in 3 days, and now Bob is back and hammering out the custom tattoos again to finish off April. The business seminar in Rome this October will be taking up a bit of my time from here on out as I edit my current plans, and distill them into a great seminar. Hell City Tattoo Festival is coming up this August, and we have 10 people from Off the Map all going together, fun fun fun! We are hiring a part timer if your an artist interested in working with Off the Map. As for TattooNOW I have been wrapping up stats, should be opening them to our clients this week. I've also been working on some long awaited catalog updates, and now that the Gathering is in full swing Im making new catalog reporting tools, our programmer is working on importing external catalogs, and all sorts of fun stuff. I have a few new tattoo artist interviews to post up as soon as I have a free moment, and I believe a six pack of sites will be launched in the following week. ok, enough talking about work for now, its back to it!